Originally created for the London Bar Show in 2007 by Darroch of Black Tie Bartending, the Clandestino (formerly known as the Clandestine Caipirinha) has long been one of my favourite absinthe cocktails. 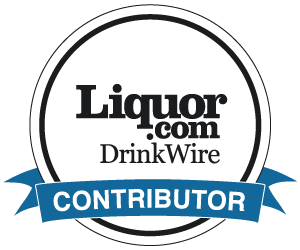 Other absinthe bloggers have enjoyed it too, with one calling it "my all-time favorite cocktail" and "my favorite source of vitamine C!" Shaken with crushed ice, and strained into a rocks glass with crushed ice already in it. Cut the limes in four parts each. Remove the seeds with the tip of your knife (crushed seeds are bitter). Using a muddler, crush down the limes with the sugar making a homogenous juice. Mix the limes with sugar in a shaker and add ice and absinthe.... shake ... pour into a glass. Drink slowly. Let the ice melt a little bit and the absinthe will be even better. In Brazil, a glass of caipirinha is not for individual use .... Share your glass .... take a sip and pass to your friend and wait for it to go around and come back to you." Of course a Caipirinha is normally made with cachaça, so I thought we should change the original name since it might upset drinks purists (who wouldn't recognise the existence of a "vodka martini"). Apparently in Brazil you can drink a "Caipirinha de Vodka" (called a Caipiroska in São Paolo), so maybe this could have been a "Caipisinthe" or a "Caipistine." But I prefer the Clandestino. Marcelo and I agree that this works very well with La Clandestine. I think a Caipirinha needs to be "clean" and "pure," so I suspect that this works especially well as it uses a blanche absinthe. A verte may not work as well. What do you think? I have a few friends who are involved with cachaça. I wonder what they will think. Now, enough writing. I must get myself organised for the Brazil World Cup and Olympics in 2014 and 2016. I suspect a Clandestino will taste even better in Rio and São Paolo! 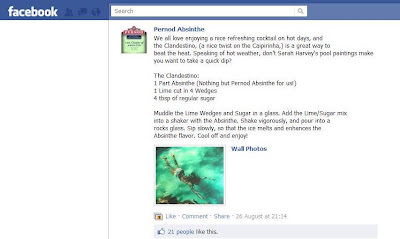 The Clandestino seems to be so popular that Pernod Absinthe featured it on their Facebook page. Click to make the image bigger. Imitation is the sincerest form of flattery, but it would have been nice if Pernod (whose first absinthe distillery was in Couvet, Switzerland, in the late 1790's) had been able to credit the creator of the Clandestino! The Clandestino popsicle. Or ice lolly. Or glace à l'eau. Depends where you come from. 1 measure of La Clandestine. 1 measure of simple syrup. 1 measure of lime juice. I particularly like the Key Lime taste because it is not so acid. But you can use only two Key Limes or one regular lime.... Most of the time people use regular lime, but key limes are so NICE in this drink ....... (Marcelo) ps: please post your feedback.... thanks ! Hi Marcelo, I've changed the 3/4 to 3 - 4 to make the meaning clearer. I have added you as a link in my blog. This is still new to me - blogging I mean - but one will always learn if you try. Just a note - I have reread my article - nowhere do I claim that Absinthe was originally created in France. Please reread my opening sentence again - I specifically did not want to misguide nor mention a country at the outset in the article. The return of Pernod Fils Absinthe!